In order to ship Priority IATA imposed new Shipping Regulations regarding Lithium Batteries. Lithium Batteries being shipped Priority are only charged to 30% of capacity. When you receive this battery it may need to be charged. This is the battery charger we recommend for this battery: OptiMATE Lithium TM-471. The new Scorpion Stinger Lithium Iron Phosphate battery offers an increased performance over traditional lead-acid chemistry batteries, while also shaving an incredible amount of weight off of the battery. These Scorpion Stingers will crank your bike, atv or scooter easily, while also weighing up to 60% less than the OEM lead acid. 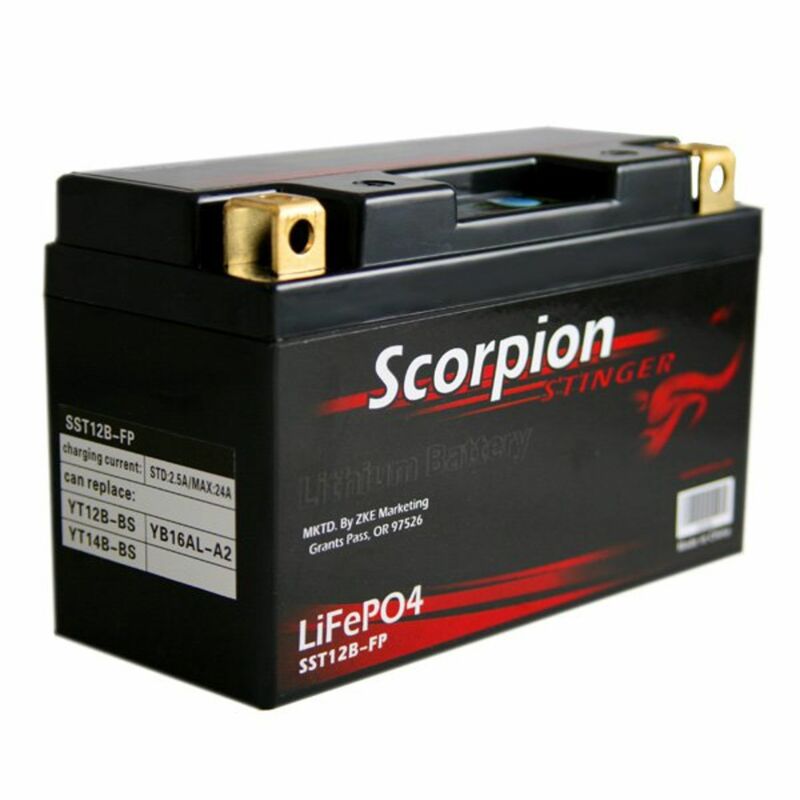 Scorpion Batteries are made by one of the largest battery manufacturers in the world, and uses their prominence and experience to create the best products possible at the least possible cost. Scorpion Battery was founded on the principle that superior quality batteries can be brought to the market at an economically pleasing price. Keeping true to that principle, Scorpion is proud to now offer the finest LiFePo4 Lithium powersports batteries available anywhere. 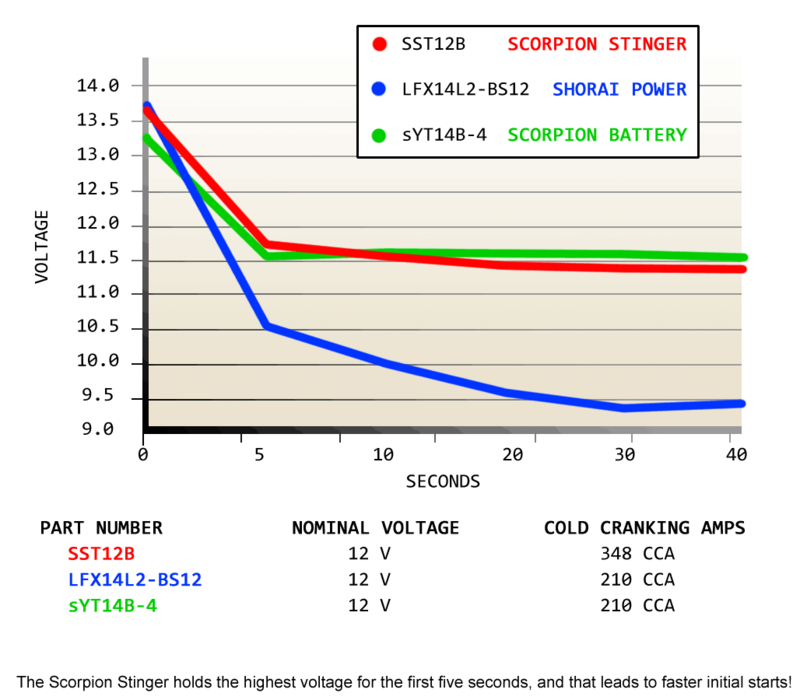 Scorpion Stinger lithium powersports batteries bring innovation to a new level. 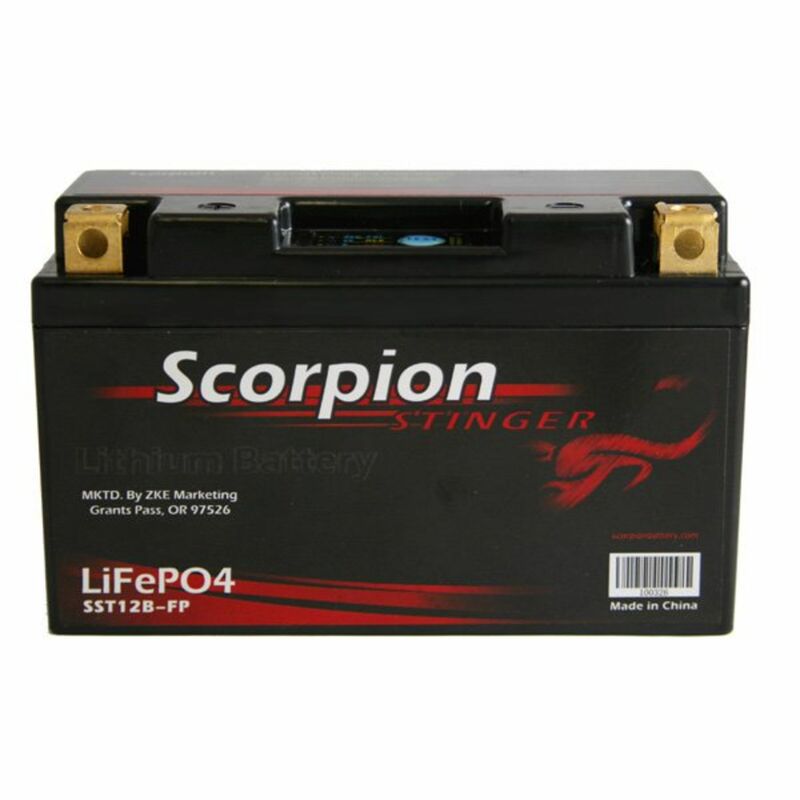 All Scorpion Stinger batteries use only the finest prismatic lithium cells, meaning that you get stronger starts, and more cycles than our competitors. Each battery contains its own Battery Management System built right into the battery. This ensures that the internal cells stay balanced with no special charger necessary. With Q4 terminals for versatile and simple hookup, and onboard charge level display with the push of a button, the Scorpion Stinger Lithium Powersports batteries are simply the best lithium battery out there, and to top it off, they are offered at the best MSRP of any major Lithium LiFepo4 or Lithium Ion battery. For use in motorcycle, ATV, scooter, snow machine or UTV (side by side) starting applications. The highest standard in Lithium powersports batteries available. Heavyweight punching power in a featherweight package. 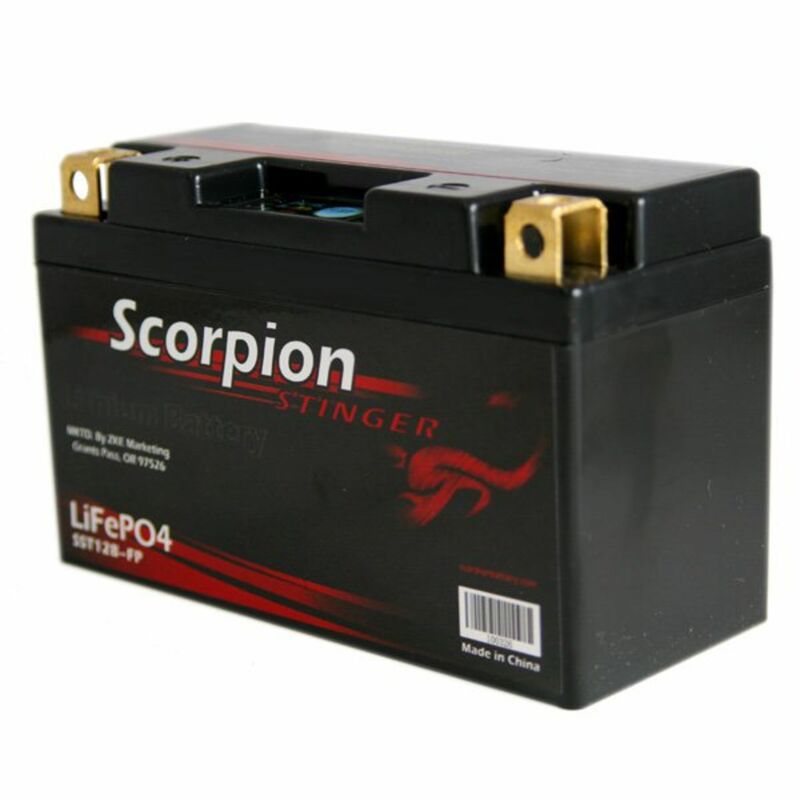 Scorpion Stinger LiFePo4 batteries are lighter and perform better than their competition. More options. Scorpion Stinger makes available more case sizes than any other Lithium battery manufacturer, meaning you get a battery that fits your application as it was meant to. 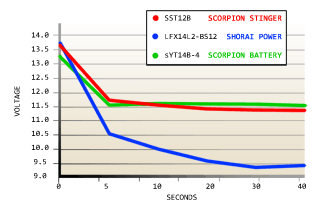 As the graph below suggests, Scorpion Stinger batteries hold a higher resting voltage than other batteries. They start higher and finish higher, meaning that during times of heavy load they have the ability to crank the starter faster and longer than the competition. For starting batteries, most of the work happens in the first 5-10 seconds. More voltage throughout that range ensures quicker starts and less strain on the starting system. 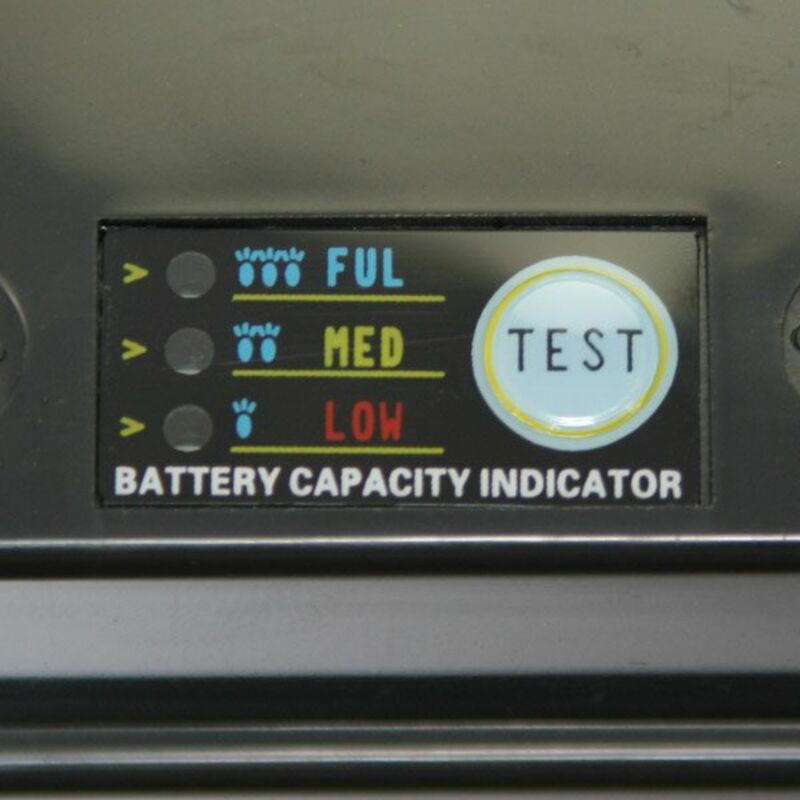 All the test batteries were fully charged and maintained for 48 hours on shop grade smart charger. Starting voltages achieved by fully charging batteries, then removing battery from any outside input for 24 hours. Each battery was tested under equal conditions at 72° F, using a true 100 AH load to simulate starting. This battery normally ships via USPS Priority mail, with expected* delivery time of 2-4 days. MAKE SURE YOU USE A POST OFFICE DELIVERABLE ADDRESS! Customer will be responsible for shipping charges on returns for undeliverable addresses. Scorpion does not rate their batteries with an AH rating*. Instead, they graph out the real performance of the batteries, side by side the best lead-acid and lithium batteries on the market. This gives you the confidence to know exactly how much starting power your Scorpion Stinger has, without giving a seemingly inflated number, or a confusingly low number that is not practical. *See more detailed explanation here. *Warranty applies ONLY to vehicles listed below. As per manufacturer, ALL other use will void battery warranty. Rated 4.87/5 Stars from 15 customer reviews. Do you own the SST12B-FP? Please, tell us what you think about it. It helps us provide you with better products. Please note that it may take up to 72 hours for your review to appear. Pros: It is a very light weight battery, comparing to the others I had before. It runs the starter motor faster and turns the engine on quickly. Cons: It is a much smaller size than the original so I had to use all the rubber padding sent with the battery to fill up the space in the battery compartment. I hope the padding lasts as long as the battery. Pros: Very light battery. Very easy to install because of smaller size. They send rubber spacers with the battery for a custom fit for your motorcycle. No charging and started right up after installation. Cons: I'll have to use it more but so far no negative's. The weight reduction alone is a good selling point. I hope it lasts as long as the original 6 years. The next lead acid battery I used lasted 1 season. Will have to wait and see how this deals with the heat of Phoenix. Pros: I am very happy with the performance of the SSTX12B-FP Scorpion Stinger High Output Battery for my 1900cc Raider. I have no problem at start-up whatsoever, it starts on the first try everytime. Cons: There were no conns expericed with this purchase or the performance of the product. The service was very good and it was delivered as promised. I will use this company for all my battery needs for any fo my vehicles going forward. Very Satisified. Pros: Surprised at how light weight and smaller this unit is, easy install with the supplied spacers and the status lights make it very convenient to check power. Bike cranks and starts with ease even in 30 degree weather, at 8 PM after sitting in parking lot all day, everyday. Headlight and instrument lights are nice and bright even with heated vest and gloves with power turned on, this is a nice +. Unit is about $30 cheaper than OEM at the dealer. Pros: So far so good, I am excited to see help performs throughout the summer. I have another scorpion in my Honda 650, that will be one year old in September...we\'ll see how it does this summer. I am confident it will make it through till fall. When the package arrived, I though who would send me an empty box? When I looked at the return address and saw that it was from BatteryStuff, my first thought was they forgot to include the battery in the shipment! Quite surprised when I opened the box and discovered there \\\'was\\\' a battery included. But my astonishment did not end there. Once installed, I was once again floored at how quickly my 4 cylinder motorcycle motor started. I own a \\\'05\\\' Yamaha FJR. Never has this thing started so effortlessly. This battery is not cheap, but it is worth every penny of its selling price. Actually, I feel it is a bargain. You will appreciate how easy it is it slip into the tiny battery box on you motorcycle. This is due to its light weight. 5 stars was not enough! Thanks BatteryStuff, You made my day! Pros: The battery worked superbly in a variety of temperature conditions in a challenging race environment! Easily outperforms traditional type batteries. Pros: Super light, charge lasts forever, Push button charge status and no special changing equipment needed! Cons: I can't think of any but, if you make me list something..... I wish it was a bit less expensive. I love this battery! I have one in all three of my bikes. When and if it goes, I'm definitely getting another!!!! Pros: Light, small, powerful, came fully charged. Started my Ducati instantly. With the addition of Hi-Capacity cables, even quicker. Cons: Tiny 4.8 mm terminal screws supplied and holes in terminals too small for my application - Hi Cap cables with auxiliary cables on a 2012 Monster 1100 Evo. I had to enlarge the holes and use longer 5.8 mm bolts and nuts. Small size required lots of padding for OEM battery mount and box to work properly and securely. Appears to be a well made product. Time will tell. My first try with Lithium motorsports batteries. Pros: The SSTX12B-FP Scorpion Stinger LiFePo4 Quad Terminal Extreme High Output lithium ion battery I bought from BatteryStuff is small and light. In an FJR1300 the battery sits high in the front fairing, and reducing that weight should make balance even better. On top of that I have more power to crank the engine - Nice set of features. Shipping and packaging were excellent. Pros: Small, light, and plenty of CCA capacity! My first foray into the LiFePo4 batteries was a Shorai of similar size and nominal capacity that I purchased for my 2009 Road Star. Unfortunately, the Shorai did not have the CCA "oomph" to turn my big twin over at temperatures in the 40's or lower. Enter the Scorpion Stinger - it's rated much higher in CCA than the Shorai and it really performs. Turns my Road Star over faster and catches even easier than the OEM lead-acid battery. I'm sold on Scorpion! Written by Anthony on Feb 21, 2019. I purchased this battery for a Yamaha Raider. The battery arrived on 12/6/2018 and was installed on 12/7 after being fully charged. The bike started faster than it ever did on a lead acid battery. The bike lives in a heated garage. Three weeks later, I tried to start the bike but the battery was dead. The test button on the battery did not cause any of the self test lights to illuminate. I then tried to charge the battery with a ctek charger. The charger could not charge the battery so the battery is completely dead and cannot be charged. As lithium batteries are only 1/3 the capacity of the typical battery they are replacing we recommend keeping the battery on a lithium charger when not in use. As today's bikes have higher parasite draws you can see how quickly they can deplete a lithium battery when not being maintained with a charger. We highly recommend lithium chargers as they have a recovery mode when dealing with a highly discharged lithium battery. Feel Free to contact our Tech line for assistance in recovering the battery. Written by Gene on Jan 02, 2019.